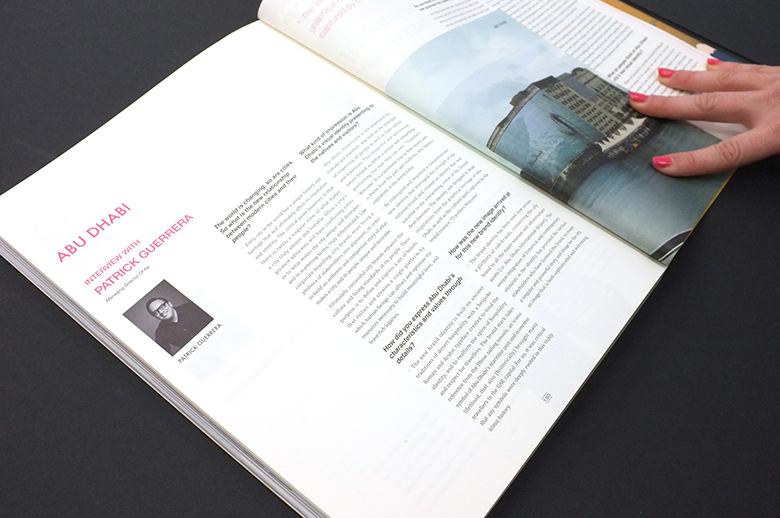 Re Managing Director Pat Guerrera, is interviewed in this month’s issue of BranD magazine on destination branding, and more specifically the work we did with Abu Dhabi. The Abu Dhabi work also features elsewhere in the magazine alongside some other top notch projects. 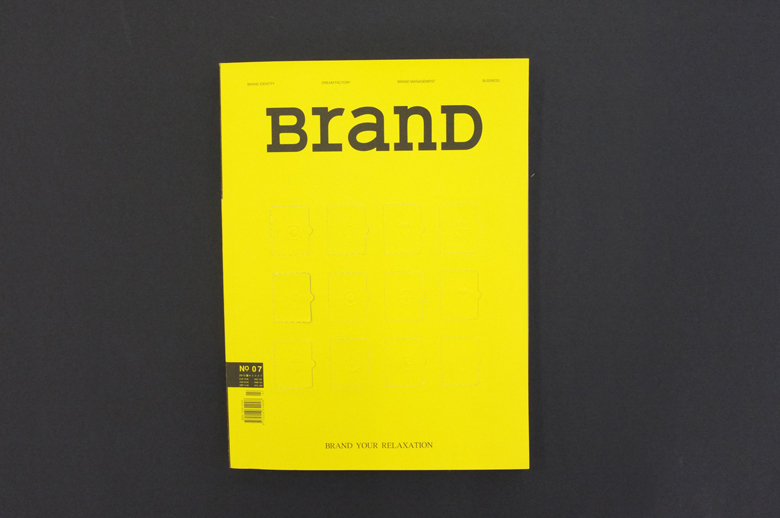 BranD is a bimonthly magazine that emphasises the relationship between brand design and business. 1. The world is changing, as are cities, so what is the new relationship between human beings and modern cities? Every city in the world has a unique history and heritage that will ultimately effect its reputation and identity. The critical point however, is that there is rarely a singular view of what makes a city truly unique and livable – often the city’s greatest advocates will have conflicting views as to what makes the city unique and desirable – and in marketing terms, truly differentiated. Like corporate branding, city brands must bring a plethora of stakeholders into alignment, in order to built an authentic and competitive story of what makes a city, and its people, unique and desirable. Ultimately, successful city brands enhance the culture and living standards of its people. Their purpose is to define and express a set of beliefs that rallies and creates single platform by which human beings can attract and optimize the resources necessary to build meaningful lives, and leave rich legacies. 2. What impression is Abu Dhabi city's visual identity presenting for natives and visitors? Abu Dhabi, historically a city populated by nomads and travellers, was built on the principal of respect all people, their beliefs and their traditions. This respectful and welcoming nature helped us define a unique and compelling positioning line that they can own – ‘Travellers Welcome’. It is a sentiment true to their hearts and is borne from the past and reaffirms Abu Dhabi’s aspirations in the world today. Re redesigned and deployed a comprehensive new identity that leveraged the strength of the national brand and created an identity that was sensitive to the overarching vision of the United Arab Emirates. The identity was designed to draw inspirations from the graphical heritage of Abu Dhabi, as well as the cultural spirit captured by the brand essence –‘Travellers Welcome’. 3. How did you express Abu Dhabi city's characteristics and values through details? The new brand identity is built on ancient traditions of desert hospitality, with a bespoke Roman and Arabic typeface created to bind the identity, reaffirming the spirit of hospitality and respect for travellers. The brand mark takes reference from the Dhow sailing vessels, an iconic symbol of Abu Dhabi’s maritime past and economic lifeblood, that also (historically) brought many travellers to the UAE capital. For us, it was critical that any symbols were deeply rooted in this richly iconic history. 4. What is Abu Dhabi city like with this brand identity? The brand identity has been used now across a plethora of sub-brands, connecting the city brand to all the major tourism and infrastructure assets (i.e. Abu Dhabi International Airport). The unique integration of historical and contemporary elements in the identity, have provided the various stakeholders who have licensed the brand, to create a singular and powerful story and image for the city. An image that is both sophisticated and welcoming. We believe it has enabled Abu Dhabi to become the global hub that it desired at the beginning of the brand design process. 5. Did Abu Dhabi city's new identities lead to some changes in the life style of the city? What changes did it bring? It is probably too soon to declare the brand has impacted the lifestyle and prosperity of its people. But in terms of economic development, the brand was launched to more than 50,000 conference delegates at the World Travel Market in 2009. For the first time, Abu Dhabi had a singular and clearly defined proposition to offer the global travel market. This event ignited a groundswell of interest in the city by consumers and trade, and by January 2012 the number of hotel guests staying in Abu Dhabi’s 127 hotels, hotel apartments and resorts rose by 29 per cent compared to January 2011, according to figures released by the Abu Dhabi Tourism & Culture Authority. This extraordinary increase can be attributed to range of factors including the increasing dominance of Abu Dhabi’s airline Etihad, and the city attracting and creating globally recognised events (i.e. Volvo Ocean Race and the Abu Dhabi HSBC Golf Championship). 6. City's identity is more valued than before. What do you think of this trend? I think that our leaders now clearly understand the economic value that a well designed and managed identity can offer its constituents. The obvious long-term value of a city winning an Olympic Games or a FIFA World Cup, secures the international standing and consideration of a city for future trade and tourism. This new economic activity attracts greater resources and opportunities to a city and its people. It also provides a platform for the city to retain their innovative minds and talent, by making the city a respected international player and a desirable place to work and live. City and place branding is still in its infancy. Some place making specialists contest that city brands deliver any value, and argue emphatically that a city can only actively manage and build its reputation – not its brand. Many of the models and mechanics of city branding are borrowed from corporate strategy and branding. I think this well evolve quickly over the next decade, as we reconsider the relationship between a city’s reputation and its brand identity. 7. Do you think a new design for a city can promote the commercial area? Could you explain it in details? I think that, as some place making specialists argue, that brand identity and reputation are inextricably linked when designing the “future state” of a city. No brand identity can drive consideration by multinationals, if the city is reputed to be politically unstable, tainted by corruption, or located in a geography or climate that will deter their staff and customers from settling there and doing business If a city has a strong competitive advantage in a particular resource or capability, this will automatically consider by business leaders. Guangzhou China is not the most livable of cities, but has an outstanding reputation and competitive advantage in labour and manufacturing, so it has prospered and attracted many of the world’s largest manufacturers. Perth Australia has boomed from both a lifestyle and an economic perspective over the last decade, mostly due to its proximity to Australia’s buoyant mining industry. Both these cities have experienced massive economic growth, but are yet to really build strong city brands. This is where city brands can play an important and help to build upon reputation and create a holistic proposition for the city that is broader than its core commercial capabilities. 8. What do people think of Abu Dhabi city's new visual identity? When we launched it we had wonderful feedback from many of the people we met at the various launches. It has definitely been well received from a trade and tourism perspective, which is what it was purpose built for. It’s now over three years since we designed it, and it has continued to evoke interest and engagement both from Abu Dhabi’s constituents and stakeholders. I think its an authentic and credible brand identity for an emerging new global city.